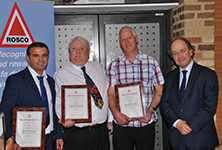 Five local bus drivers along with 221 Oxfordshire drivers are recognised at the Safe Driving Awards. Oxford Tube has announced Rob Hough as its new Operations Manager. Unclaimed money left on Stagecoach buses and Oxford Tube coaches over the past 12 months is given to local children’s hospice.